What we have in Singapore now is “Call Forwarding” and we are trying to move to “Onward Routing” or “All Call Query”. Both will give us true number portability (ie, the Caller ID will match your number) but the difference is the efficiency of the system. If a small percentage of users do number port, then Onward Routing is more efficient and if a large percentage of users do number port, then ACQ will be more efficient. The IP Telephony numbers auction and ENUM pilot trial is a follow-up from IDA’s launch of the IP Telephony and ENUM policy framework in June this year. The framework is designed to facilitate the entry of companies interested in offering IP Telephony services in Singapore and is expected to bring about reduced costs and more choices in providing telephone services. May to 3rd June 2005 at ETSI Headquarters, Sophia Antipolis, France. Washington DC – (October 28, 2004) – Today, several leading telecommunications and Internet companies have announced the formation of a new organization, the Country Code 1 ENUM Limited Liability Company (CC1 ENUM LLC), to build the public infrastructure that will promote the development of ENUM technology in a single, carrier-class manner within the countries of the North American Numbering Plan (NANP). The countries of the NANP include the United States, Canada and the Caribbean nations. There is a APEC TEL NGN Brainstorming session this morning. I was one of the speaker for the session and did a presentation on IP Telephony and ENUM. Singapore also made a contribution on both IP Telephony and Spectrum management. Both my presentation and Singapore contribution was well-received by the participants and I got a lot of feedbacks after the session. IDA also announced a proposed policy framework for IP Telephony and ENUM this afternoon1 and it is open for public consultation! It is a long journey for our virtual team who has spend over a year on this! 1. IP Telephony will be classified under SBO(Individual) license instead of the more heavy FBO license. 2. Licensee is entitled to apply numbers in a new number block +65 3xxx xxxx. 3. Optional interconnection with PSTN, no QoS, no emergency service and no universal obligation. 1 In other words, it is not announced by me. 2 There is also a short explaination of IP Telephony & ENUM. ENUM SDK includes DLL for Windows and VB/VC++ sample code. ENUM Client is a reference application of ENUM using ENUM SDK. Based on this development experience, Fujiwara who is my colleague, pointed out ambiguousness of rfc2916bis at Seoul IETF and now he is working on draft-ietf-enum-experiences-00.txt. Carrier ENUM is a disaster! Basically, I screwed up big time and failed to managed the time. Or perhaps I was stumbling (I notice I do that when I dont get enough sleep). Either way, what happened is that while we still taking strawpolls of requirements, before discussing next step, half of room suddenly stand up and walk out, hurrying to get to their muffins and coffee. 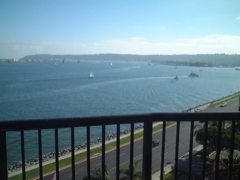 I am now at Sheraton in San Diego. The last time I was here is in 2000 for IETF #49. Nothing seem to change much but it appears almost everyone who is vacating in US is here in San Diego. I almost couldn’t get a hotel at all and have to stay at the Hilton 10mins from Sheraton. I am posting this from the SIA Lounge waiting to fly to San Diego for IETF #60. The main purpose there is to organize a “Carrier ENUM” mini-BoF with Richard Stastny on Wed afternoon. Carrier ENUM aka known as Infrastructure ENUM or Operator ENUM is a new way we notice carriers and operators starting to use ENUM to do “number resolutions” within their network or between carriers. It is quite different from what we envision how ENUM would be used in the first place (ie, individuals coming along and register their phone numbers) and many people expressed doubts whether ENUM could satisfy the requirements in the first place. It is going to be an exciting discussion. Incidently, there is an interesting article at Telepocalypse regarding pay-and-keep settlement among US carriers in 4 years time. Such model is already been used in SMS but it could be pretty disruptive if carriers adopts it. Considering the operation cost to do minute-charging is more expensive then the settlement itself (due to falling prices in voice-calls), it does makes a lot of sense. More importantly, this will bring about a change in the business landscape in the voice market, one which could potentially bring more competitions to the market since carriers are not longer dictated by the most powerful incumbent termination charges. It is also an inevitable development for the telecom market to transit from a 200B industry to 20B. Painful but neccessary. ps: See my previous entry on how voice-termination are been done today.